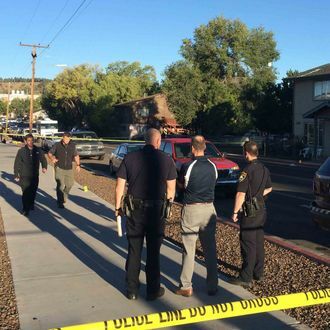 A deadly campus shooting at Northern Arizona University, in Flagstaff, took place at 1:20 a.m. Friday, local time. According to NAU police chief Greg Fowler, “several of our students, two separate student groups got into a confrontation.” One student is dead, and three others were injured. The shooter, Steven Jones, an 18-year-old freshman, was taken into custody, according to campus police. The shooting took place in the Mountain View Hall, a Greek-life residence. Campus police described an altercation between Jones and the four victims, all freshmen, in which an agitated Jones revealed a weapon and began to shoot. It appears the victims were members of the Delta Chi fraternity. The organizing body of the group posted this statement, in which the group confirms members were “involved” in the incident. The shooting comes only a week after another campus attack, at Umpqua Community College in Oregon. The gunman in that incident killed ten students before taking his own life. President Obama is scheduled to visit with the families of victims in private later Friday. Although Arizona gun laws are among the most permissive in the country, Fowler noted that the Arizona Board of Regents prohibits students from carrying guns on campus. They are, however, allowed to keep them in their car.